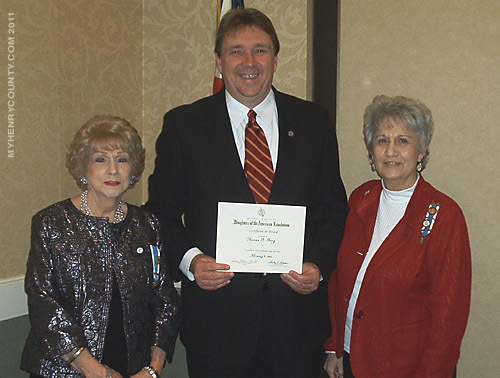 This award is not a local award, but approved by the National Society of the Daughters of the American Revolution in Washington, D. C.
THE REMARKS OF REGENT JOAN FRITH AT THE CEREMONY ON FEBRUARY 9, 2011 AT THE DUTCH INN IN COLLINSVILLE, VIRGINIA. “The Patrick Henry Daughters of the American Revolution would like to present the National Society of the Daughters of the American Revolution Community Service Award today. This award recognizes worthy residents from a variety of walks of life for their unpaid voluntary achievements. The recipient must have contributed to the community in an outstanding manner. It also must be approved by the national chairman. Our Community Service Chairman, Dot Powell, submitted letters of recommendation and supporting documentation from Patricia Ross, Director of the Bassett Historical Center, Deborah Hall, Director of the Martinsville Henry County Historical Society, Andy Doss, past president of the Sons of the American Revolution and Delegate Ward Armstrong. Thomas David Perry has devoted much of his life to the preservation of history. He founded the J. E. B. Stuart Birthplace Preservation Trust. He is the author of 15 books on local and regional history. A portion of the proceeds have been donated to a number of local organizations. He donated all the royalties from the sale of his book, Images of America,Henry County, Virginia to the Bassett Historical Center raising over $25,000 for its building campaign. He is chairman Of the Henry County Virginia Heritage book committee and proceeds of this book also going to the building fund for the Bassett Historical Center. His donations to schools, museums and communities have been numerous. He has spent the last 25 years of his life preserving and sharing the history of our region and Nation. Perry’s acceptance remarks for the NSDAR Community Service Award. Peter O’Toole gave the best acceptance speech I ever saw several years ago for an honorary Oscar. He said he was as delighted as he was honored and I too am honored. The magic of the movies enraptures me, a habit I get from my father. I am into James Stewarts. Jimmy Stewart and James Ewell Brown Stuart. In the film It’s a Wonderful Life Jimmy Stewart contemplates suicide until his angel Clarence show how different the world would be without his life. Well, I know that Stuart’s Birthplace in my hometown of Ararat, Virginia, would have a house on top of it and while the Bassett Historical Center addition would be built, I don’t know how much of it would be paid for. Historian Thomas D. "Tom" Perry is the author of 15 books on regional history surrounding his home county of Patrick. He writes on neighboring Henry County, Virginia, and the place he now calls home, Mount Airy, Surry County, NC In 1990, Perry started the J. E. B. Stuart Birthplace in Ararat, VA and recently worked to expand the Bassett Historical Center assisting in raising over 1 million dollars over the last twenty years for non-profit organizations. A graduate of Virginia Tech, where he studied under renown Civil War Historian James I. “Bud” Robertson, Perry speaks all over the region and country on J. E. B. Stuart and his Free State Of Patrick, Patrick County, Virginia. Perry’s collection of papers, books, and images are housed in the Special Collection Department of the Carol M. Newman Library at Virginia Tech. He is recipient of several awards including the John E. Divine Award from the Civil War Education Association, Hester Jackson Award from the Surry County Civil War Round Table, and the Best Article Award from the Society of North Carolina Historians for his article on Stoneman’s Raid in 2008. In 2010, he received acknowledgement from the Bassett Public Library Association for his work to expand the Bassett Historical Center and was named Henry County Virginia Man of the Year by www.myhenrycounty.com. Perry edited the Henry County Heritage Book Volume One in 2010, which again raised money for the Building Fund of the Bassett Historical Center. Visit Tom Perry’s website www.freestateofpatrick.com for more information.